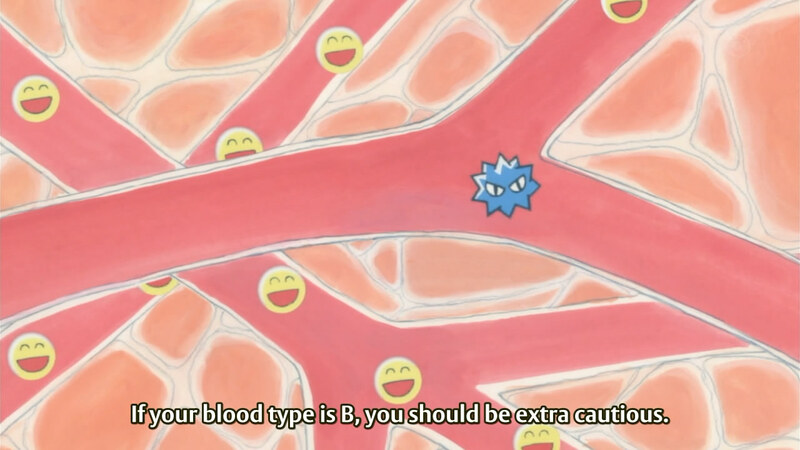 Oh, so that's what the bloodstream looks like. The episode began with Rin and Daikichi watching TV (well, the latter wasn't really paying attention), when the program began talking about health and taking care of oneself. Rin became visibly upset when declining health was mentioned and, after turning the TV off, questioned Daikichi if he was going to die soon, and if she too would die. It was pretty obvious that this was probably the source of her recent bed-wetting stress, but Daikichi didn't figure that out until the end of the episode. The female body is so amazing...and freaky. At work, Daikichi's subordinate made passing references to how he was leaving early those days, instead of taking the last train home like he had done all of last year. It's amusing how, even though Daikichi has apparently been leaving early, he and Rin still don't get home until pretty late. Anyway, the two met a fellow employee, Gotou, who apparently used to be a top performer in the sales department but willingly asked for a demotion when she became pregnant. By the way, perhaps it was just me, but I thought that the comment shown above was a little intrusive and inappropriate. Usually, I'm of the mentality that the western ways of workplace conduct are a little too rigid and precautionary, removing a sense of ready familiarity, but even this line seemed a little too much. Will she act like Reina now too?! Anyway, apparently the 10 days, starting from ep02, was almost up, because Daikichi noted that he needed to find a new nursery for Rin soon. This is what led to him having lunch with Gotou, telling her about his situation in order to get some advice (especially about the bed-wetting). I would have thought that the idea of having the kid go to the bathroom before going to bed would be pretty obvious, but it just highlighted how little experience Daikichi really had with children. In the episode, he asked Gotou for advice once more, before making his big career move. 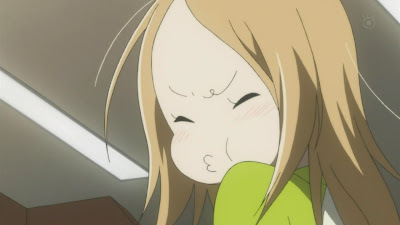 For her part, Gotou's response was incredibly interesting; whether or not she felt regret was not the question, but rather it was how to keep moving forward. Ah~ So maybe that's how the grandfather bagged such a young woman. Daikichi's visit to his parent's house was spurred by his mother calling and asking how Rin was. 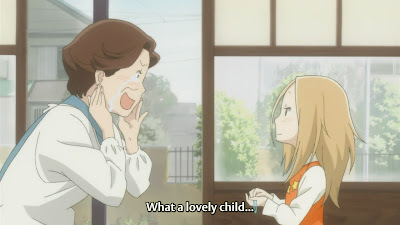 It was interesting to see that she was genuinely curious and concerned about Rin, since her son had taken the child in. Whatever the reason, it's obvious that Rin had edged her way into the family. Daikichi decided to visit, also in order to go to his late grandfather's house (who lives there at this point, anyway?) to see if he could find any clues about Rin's mother. I'm a little confused in regards to what he wants to do should he find the woman; throughout the episode, he made it seem as though he thought the arrangement was for the long-term. How would he keep taking care of Rin if her mother returned? He's totally wrapped around her pinky. Like true "grandparents", Daikichi's mother and father were entirely enamoured with Rin once they sanded off the bitter feelings of her being a stranger. Daikichi's mother wanted to be called an "aunt" (although Rin is her half-sister...), and was entirely taken in when Rin said that she was not old enough to be a grandmother. 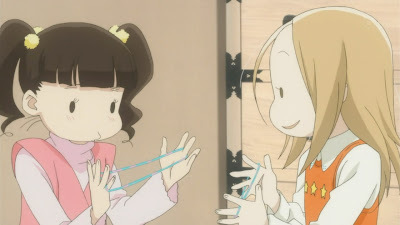 It only continued from there, as Rin showed that she already knew how to play Cat's Cradle, and also said that the yarn (which Daikichi's mother had woven herself) was pretty and comfortable. 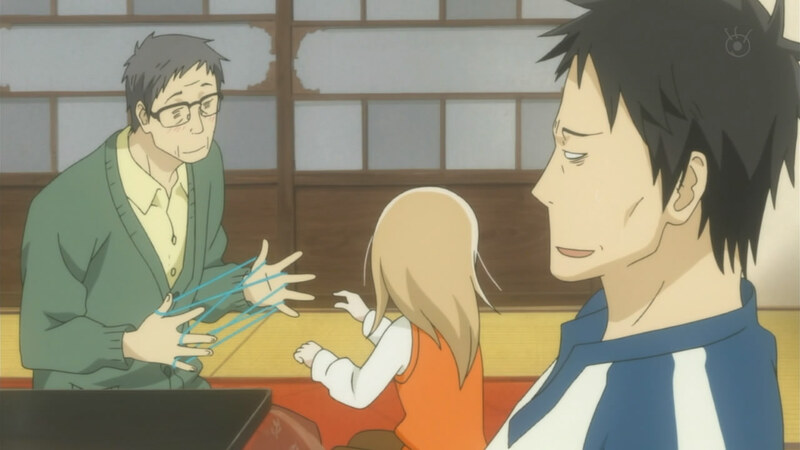 Daikichi's father just wanted to be included and let himself be taught by Rin how to play with the string. 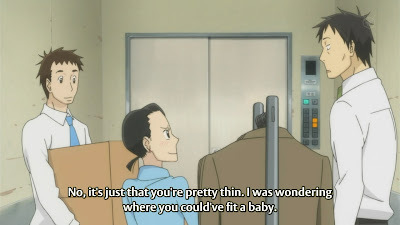 Near the end of the episode, they were found asking Daikichi's sister if she didn't want to give them a grandchild, even after telling Rin that she could visit whenever she wanted. 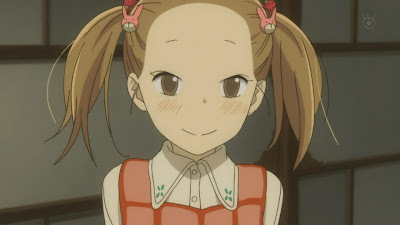 I can accept Reina when she's so docile. 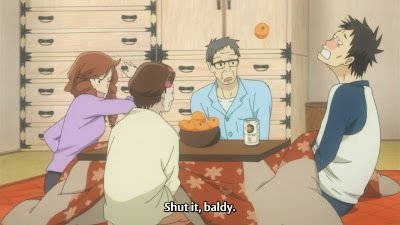 Daikichi's cousin visited with Reina, at his request, and talked about how it was amazing that Daikichi, a man, was juggling his job and taking care of a child, and how her own husband didn't help out at home at all. It might be just me, but it really seems like there will be some kind of side story regarding Daikichi's cousin. She seems to have her hands full at home. 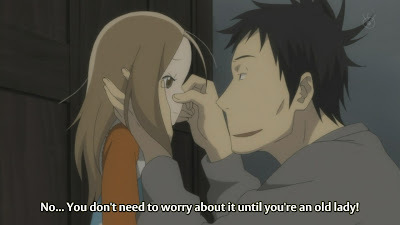 Although many women are in that situation, seeing Daikichi working so hard might make her realize that it doesn't have to be that way, leading to change...or divorce. We'll see. I'm surprised that Rin and Reina get along so well, considering Reina's extremely rude behaviour with her at the funeral. I guess children really do have the capacity to forgive, since I'm sure that Rin understood what was being said. The trip to his grandfather's house yielded no results, and Daikichi commented that no will had been left behind. It's a true mystery; you'd think that he would genuinely care about the fact that he would die soon and leave behind his toddler. On the train ride home, Daikichi asked about the modem that he had found at the house, leading Rin to talk about the maid - Masako. It's really interesting how Rin remembers the woman that should be her mother as the maid. Is it true, then? Perhaps Masako was the maid hired by the grandfather, and an affair began that culminated in Rin's birth. 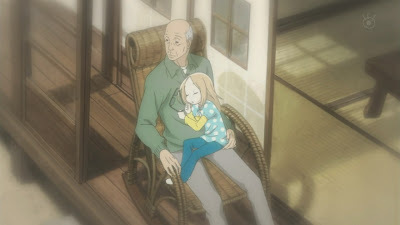 It's quite possible that Masako wanted to have nothing to do with the child, and the grandfather allowed her to continue being the maid without needing to be a mother. Of course, Rin also spoke of Masako being angry with her and hating her, so it begs the question of why Masako even went through with the birth (unless the answer is that she was against abortion). I really, really hope they address all of these issues. Now that he's given up smoking, his chances of avoiding natural death are indeed higher. Daikichi finally figured out that Rin's bed-wetting was being caused by her fears of being left alone, as she kept asking about death. The promises he made could easily go awry, seeing as how no one has control over death, but what else was he going to say? I still like his way of parenting, lie-filled as it may be sometimes. But this realization that Rin was worried about being left alone ended with Daikichi making the decision to ask for a transfer to another department, one that didn't have such long hours. Truthfully, it's pretty clear that it's a demotion. I'm glad that the supervisor (or whoever he was) understood so well; one's career is very important, but a lot of things do trump it in many situations. This was another quick-paced episode, with the stage being set for a lot of stories to go on. Rin began going to her new nursery at the very end of the episode, so perhaps there will be stories for her there, as well. It's not like I'm on the edge of my seat, but the concepts being presented here are very interesting - and, dare I say, slightly more interesting than various aspects of Aishiteruze Baby. This, somehow or the other, feels a little more real.